The ecological fallacy occurs when analyses that are based on grouped data lead to conclusions that are diﬀerent from those based on the analysis of individual data. One of the early examples is given in Robinson (1950). This is closely related to a problem that I have been aware of for a long time under the name of "change of support problem" - which is how it is known in the field of mathematical morphology and integral geometry. I recently found out that within spatial statistics and GIS it has another special name; Modifiable Areal Unit Problem (MAUP). The basic problem is that for spatial data, such as Health outcomes recorded by zip-codes or counties, socio-demographic data from Census tracts, safety or health exposure estimates within a region of suspected source etc etc, statistical inference changes with scale. A classic early paper is Gehlke and Biehl (1934) who found that the magnitude of the correlation between two variables tended to increase as districts formed from Census tracts increased in size. Waller & Gotway (2004) describe it as a "geographic manifestation of the ecological fallacy in which conclusions based on data aggregated to a particular set of districts may change if one aggregates the same underlying data to a different set of districts". 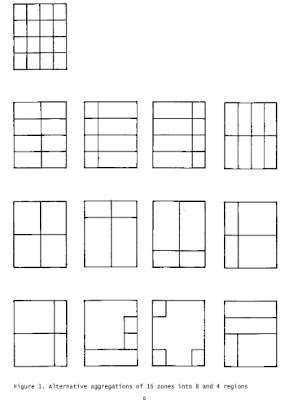 The paper by Openshaw and Taylor (1979) described how they had constructed all possible groupings of the 99 Counties in Iowa into larger districts. When considering the correlation between %Republican voters and %elderly voters, they could produce "a million or so" correlation coefficients. A set of 12 districts could be contrived to produce correlations that ranged from -0.97 to +0.99. 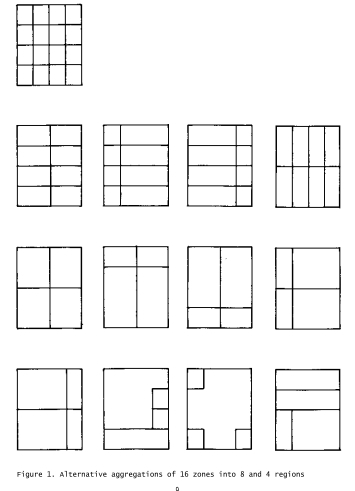 below is an example figure from Openshaw (1984). Gehlke, C. E. and K. Biehl (1934). Certain effects of grouping upon the size of the correlation coefficient in census tract material. Journal of the American Statistical Association, 29, 169-170. Openshaw, S. and P. Taylor (1979). A million or so correlation coefficients. In N. Wrigley (Ed. ), Statistical Methods in the Spatial Sciences, London, pp. 127-144. Pion. Waller, L.A. and C.A. Gotway. 2004. Applied Spatial Statistics for Public Health Data. Hoboken, NJ: John Wiley & Sons. Q: What did 1015 Sunsets ever give us? A: Eyes.